This shrub has enjoyed an extensive history of medicinal use, and nowadays, it is one of the best herbal tools in the fight against the deadly malaria. The sweet wormwood plant is the modern world's answer to malaria, most importantly to the increasing numbers of antibiotic-resistant strains. The plant is native to grassland and open areas in Vietnam, Japan, China, Russia, and North America, and has been widely naturalized in other parts of the world. Treating malaria and dengue fever. Sweet wormwood has been shown to be up to 90% effective in curing and preventing malaria, as well as dengue fever. Relieving headaches and fever. The herb's extract has been traditionally used as an anti-inflammatory, antipyretic agent. The most important compound in sweet wormwood leaves is a an antimalarial sesquiterpene called artemisinin, which works by disrupting the sexual reproduction of the most deadly malarial parasite, Plasmodium falciparum, eventually killing it off completely. 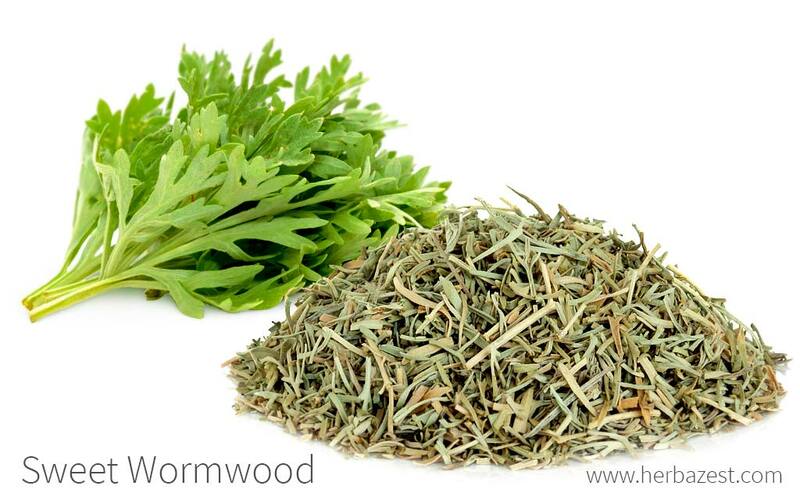 Besides antimalarial activity, sweet wormwood has antioxidant, antibacterial, antifungal, and anti-inflammatory biological activities, due to the presence of secondary metabolites, mainly flavonoids, steroids, aliphatic hydrocarbons, aromatic ketones, aromatic acids, phenylpropanoids, alkaloids, and coumarins. These compounds not only contribute to relieve fever and headaches, but are also are known to interfere directly or indirectly with various inflammatory mediators, including nitric oxide (NO), which plays a central role in inflammatory and immune reactions involved in neurodegenerative disorders, such as Alzheimer's disease. Artimesinin works by disrupting the sexual reproduction Plasmodium falciparum, a protozoan parasite that causes malaria. Herbs that also help reduce fever and pain are aspen and lemon verbena. Although sweet wormwood is generally free of side effects, it should be taken under the supervision of a doctor, who will be able to monitor the state of the malaria infection. Pregnant women should not take sweet wormwood except with a doctor's guidance. This herb should not be taken over a long period of time due to potential toxicity, but for the treatment of malaria, only short-term use is necessary. Dried. The dried leaves of sweet wormwood can be used to prepare herbal remedies at home. Infusion. The dried leaves of sweet wormwood are traditionally steeped in hot water, and the warm infusion is taken for soothing headaches and reduce fever. Tincture. This is a concentrated form with a long shelf-life, obtained from the maceration of sweet wormwood with alcohol. few drops need to be diluted water to reap the medicinal properties of the herb. Capsules. Supplements are the most commonly used form of wormwood in the treatment in malaria because they are standardized. Because malaria is a serious illness, wormwood supplements should be taken under the care of a physician. Sweet wormwood is usually processed pharmaceutically into concentrated malaria medications - such as artemether - as the plants only contain about 1% artemisinin. The dried leaves of sweet wormwood are more difficult to obtain locally, but are readily available for purchase through online retailers. Sweet wormwood capsules are widely available through online retailers and in specialized health stores. Artemisinin-based antimalarial pills are also available, but usually sold only with a prescription. In countries with temperate to subtropical climates, sweet wormwood cultivation is quite easy. Sweet wormwood can be propagated from seed and must be planted in the spring, as it needs full sun in order to survive, but can also be propagated by dividing the root stock in autumn. Sweet wormwood planting should involve sowing the seeds about 18 inches (45 cm) apart and lightly pressing the seeds onto the top layer of soil, as they need light in order to germinate. Once the sweet wormwood plants have started growing, they only need occasional watering, and being pruned now and then in order to prevent them from becoming too unruly. Sweet wormwood plants can grow up to 6.5 feet (2 m) high and bear bright green, saw-toothed leaves. The sweet wormwood flower heads are minute and cream-colored. Sweet wormwood (Artemisia annua) is a member of the Asteraceae or sunflower family, which comprises about 30,000 species across 2,000 genera. Other medicinal herbs within this large family are chamomile (Matricaria chamomilla), chicory (Cichorium intybus), dandelion (Taraxacum officinale), and marigold (Tagetes erecta); while artichoke (Cynara cardunculus), lettuce (Lactuca Sativa), and sunflower (Helianthus annuus) are among the most economically important ones. There are over 100 Artemisia species, some of which are used in food and drink products. Close relatives of sweet wormwood (A. annua) include tarragon (A. dracunculus) and absinthe (A. absinthium). The species A. apiacea can be used interchangeably with for medicinal purposes. The history of sweet wormwood seems to stretch back to 168 BCE, when it was mentioned in a text proclaiming that it "helped clear and relieve summer heat." It is a traditional Chinese medicine, having been used for more than 2,000 years to alleviate fevers. However, more recently, attention has shifted to its well-researched antimalarial properties. Scientific studies into this use of sweet wormwood began in the 1970s, as strains of malaria that were resistant to conventional medications of the time started appearing. The sweet wormwood market is a booming business, and it is cultivated on a commercial scale in China, its largest producer. Many pharmaceutical companies convert artimesinin into the medicines artemether and artemotil, so sweet wormwood trading is becoming more and more profitable. Cosmetics. Sweet wormwood has few uses other than its medicinal value, although the aromatic essential oil is sometimes used in cosmetic products and perfumes. The medicinal power of sweet wormwood has been known for millennia, although its use as a malarial treatment is relatively new.